Buster Williams, bass; George Brown, drums. This isn't jazz to sit down and think about, or jazz to write books and papers about, or jazz to analyze and grow old over. This is jazz for swinging, listening, and for all-out dancing. 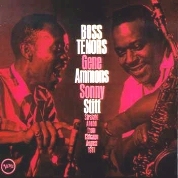 Gene Ammons and Sonny Stitt were co-leaders of their own group in 1950, and blew each other off the stand nightly in clubs and concert halls from coast to coast. Now the Boss Tenors are back together again, and the old excitement and drive are still there, fanned white hot by the years of experience each man has had heading his own jazz group. 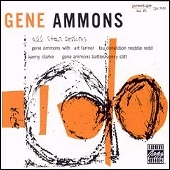 Gene Ammons is a Chicago boy, son of the famous boogie woogie piano player Albert Ammons. At 36, Gene can look back on a jazz career far richer than what one might expect from such a young man. At the age of 18, Gene was playing with the noted King Kolax band. He first came to the attention of jazz fans with his playing in the sax section of Billy Eckstine's band. Later Gene succeeded Stan Getz in the Woody Herman Herd of 1949. In 1950 he formed a group with Sonny Stitt and started the nightly locking of horns that created some of the most frantic and hard-driving moments in all of jazz. British writer Alun Morgan has described Ammons as "an inventive soloist whose big tone gives him a commanding personality." Sonny Stitt was originally called Edward back in Boston where he was born in 1924. Stitt, like Ammons, hailed from a musical family; his father was a college music professor and his brother a concert pianist. He worked in such big cities as Detroit and Newark before gaining prominence with Tiny Bradshaw's band. In the mid 1940s Sonny played with Dizzy Gillespie and became known as a leading bop alto man. 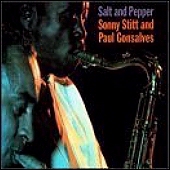 After he and Ammmons shared the bandstand for two years, Sonny toured with Norman Granz' Jazz At The Philharmonic. He has recently been recording and leading his own group. But now the Boss Tenors are together again, and blowing in a groove that just won't stop. For this meeting in Chicago, the Boss Tenors were set up in the recording studio at separate microphones, with Ammons on the right and Stitt on the left all the way. Blues Up And Down -- Eight minutes and 45 seconds of stomping blues get underway with Gene taking the first solo break, Sonny the second, Gene the third, Sonny the last; and then the Boss Tenors duel for one chorus of four-bar exchanges. Gene takes a long series of choruses, every now and again giving his characteristic cry as he works. Sonny picks up Gene's last note and uses it as the jumping off place for his solo. The Boss Tenors take another chorus of exciting fours, then blow alternate notes before taking the piece out. Counter Clockwise -- John Houston's loping piano kicks off this snappy piece, spiced at the start by the bass punctuation of Charles Williams. The Boss Tenors take alternate breaks, starting with Ammons. Gene kicks off the soloing, building his choruses one after the other, with fury. He double-times the third and fourth, and goes into the last of his six choruses with a powerful drum roll supplied by George Brown. Sonny also takes six choruses, and saves the last two for some double-time fireworks. Houston jumps in on piano for one chorus, Williams takes one on bass, and then the Boss Tenors come back for some four-bar exchanges. The group takes it out with Ammons leading the final few exchanges. No Greater Love [mp3] -- Side Two opens with this ballad taken at finger-popping tempo. After Houston's piano introduction, Stitt, switching to alto sax for this tune, takes an eight-bar solo. Gene, still on his big-toned tenor, takes over up to the release. Then Stitt returns for eight bars, giving way to Ammons who finishes the melody and kicks off his solo with a two-bar break. Stitt jumps back after Gene's chorus and takes two choruses, double-timing his way through half of the second one. The Boss Tenors have eight-bar exchanges before Sonny leads Gene through a call and response pattern on the long coda. The One Before This -- A curious one-note melody, punctuated by Williams' witty bass, is stated by the Boss Tenors before Gene jumps into his two choruses. Sonny snaps off a pair of crackling choruses, then Houston and Williams take one each before everyone picks up and gets back to that funny, one-note theme. Autumn Leaves -- Sonny states the first eight bars of the theme. Ammons follows with the next eight. Sonny and Gene repeat this pattern, then Gene has a break and two choruses. Sonny takes his two go-rounds, then Houston takes a half-chorus and Williams finishes it off. Sonny and Gene alternate blowing on the final chorus, then take it out together. --CREED TAYLOR, from the liner notes.